 The Melissa & Doug color matching game is a fun game that plays with a board.  Consists in sorting cards and matching them by color.  Children express their creativity and develop basic math skills. 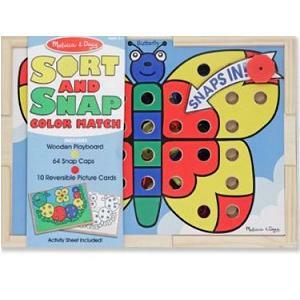 The Melissa and Doug Snort and Snap Color Match (for ages 3-6) plays with a board and consists in sorting cards and matching them by color. Children put pegs in holes in order to hold the cards in place. The game comes with instructions and a list of activities. The board and the cards are very durable and can last for years. Overall, we believe that the game is great value for the money and a great idea for a birthday present. By sorting the cards, children develop some basic math skills. They develop their memory as they memorize the cards. They can also express their creativity by making pictures and different patterns using the cards on the board.